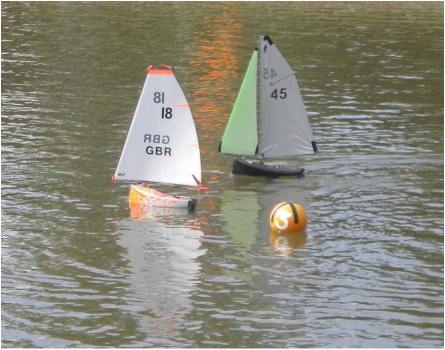 We were pleased to welcome a number of new visitors to Abington Park for Act Six of the Extreme Footy Series, as usually the course was a tricky, short legged affair which required the utmost concentration from the skippers. Unable to easily assess the wind direction which was variously described as "all over the place", "unreadable" and "that's not what the wind sock is saying" the RO set a compromise course which had a bit of everything, however sometimes it had a lot of one thing. 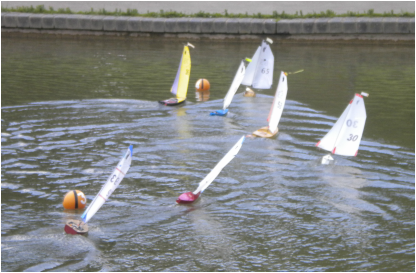 The short legged course on Abington Park was supposed to be a beat to start, round an upwind mark and spreader to port, back downwind to a gate back up to the upwind marks a couple of times and finishing with the skippers favourite a port rounding to a beat to the finish close to shore. Birthday boy Peter Shepherd (65, Fat Boy) was on exceptional form dropping only 2 points in the first 13 races and winning the double point final round. His usual nemesis Mike Ewart (36, ICE) seemed to be having an off day, perhaps the recent sunshine had got to his head, taking him until race 13 before he put a win on the scorecard. Peter Jackson, (30, Fat Boy Slim) was consistently in the top half of the fleet and was the first to take a race win off Peter S in race 10. 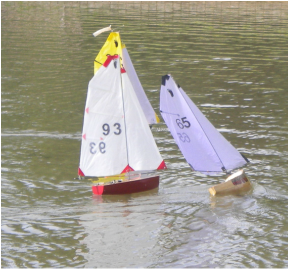 Once again it was all very close in the pack where the real battles were taking place, Geoff Raygada (41, Fat Boy Slim), just held on from the ever improving John Burgoine (45, ICE) by virtue of some astute rig choices in the final two races. Paul Risdale (53, Wice) was also in the mix with these two, scoring a number of notable high placed finishes but being unable to be consistent enough to move up the standings. Sid Sims (05, Fattest Boy Slim we've seen) started brightly enough with a couple of good places, went off the boil a bit, and then came back a bit stronger towards the end. 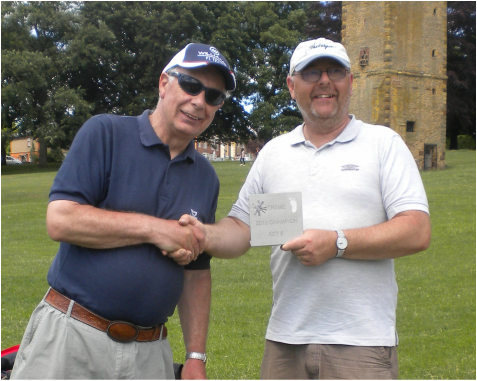 Mark Unitt (18, 12" Slim) was running consistently 5th and 6th when a rudder servo failure put pay to his day, unwilling to mess about fitting a replacement he kindly took over from Derek Lane on scorecard duties, with Tim Leese (93, Puma30) helping out later on. Your assistance in in this regard is much appreciated. The next Footy event is the Birmingham Footy Open 25th July 2015 and the we are off to Two Islands for the ACT SEVEN of the Extreme Footy Series Race 1st August 2015. 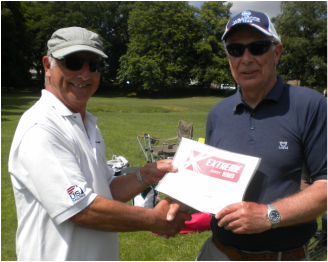 John Burgoine is Act Six Extreme Footy Above & Beyond Award Winner.